If I haven’t seemed quite here this past week, it’s because I’m in the middle of finals. Yeah, I know, my university finishes the year quite a bit later than most others, but that’s okay, because we get to start a lot later too! We don’t start until the end of September! 😛 Wish me luck – one more final this quarter, and then only a year left in school! I can’t wait to be out of here! Cook the rice, using equal parts rice and water. I use a rice cooker, but you can also cook it on the stove if you don’t have a rice cooker. Mix the shoyu, oyster sauce, and sugar in a bowl until the sugar is completely dissolved. Cut the spam into about 10 pieces, horizontally (like you are slicing the top off each time). Keep the can! Place the span in the shoyu mix, marinate for about 5 minutes. Put the oil in a frying pan, heat over medium heat. Fry the marinated spam until brown, about 2 minutes on each side. Cut the nori into strips about 2.5 inches wide. Wash the can that the spam was in very well. Fill the can loosely with rice, then pack the rice into the can very tightly. It should end up about an inch or so thick. Update: To get the rice out of the can, I slammed the can upside down on the cutting board until the rice came out. You might also try to line the can with plastic wrap before you pack the rice, so it’s easy to pull it out. Place the rice on one end of the nori, so that they are perpendicular. Place a slice of spam on the rice. 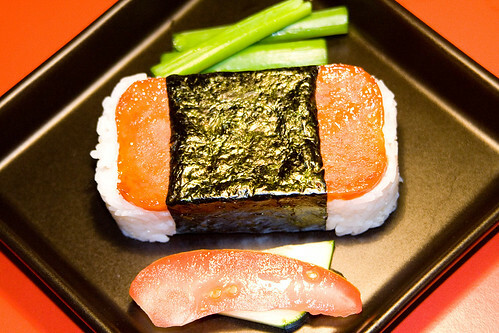 Wrap the nori around the spam/rice stack. Hold closed for a few seconds, it should stick. If it doesn’t stay closed, use a drop of water to close it. 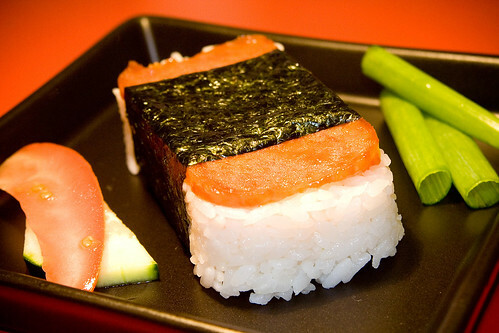 mmm spam musubi… how do you shape the rice so cleanly? That’s always been a challenge for me whenever i make one of these. I am intrigued. I wonder if I can convince my husband we need to make this! Laureen, yup she did use the spam can for a sushi mold. It was quite clever I thought. 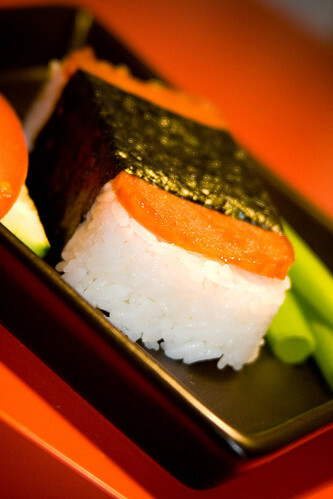 Now this a novel way of making musubi! 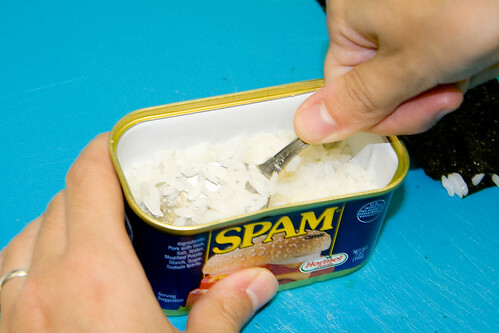 Incidentally, did you know that the word “spam”, as for unwanted e-mails, actually comes from this food? Now, I wonder if we could use the term “spam sushi” for unwanted sushi? Laureen – 😀 yeah, I used the spam can to shape the rice. Hehe I had forgotten to put the picture up when I first posted this, and then when Son saw your comment he was like, where’s the picture??? Oops! 😛 Mmmmm ketchup! I hadn’t thought of that, I’ll have to try that next time I make this! Josh – Yep – the spam can! Where did you see the recipe?? I would definitely like to check that out! Son – Thanks for taking over for me while I was busy studying for finals! Which by the way, I am finally done with! Yay! Robert-Gilles – Yeah, kinda sad because it gives such a bad connotation to spam (the food) when it’s actually quite good! Hehe I trust you’ll let me know if any of my sushi is “spam sushi”! I love your discoveries and inventions! 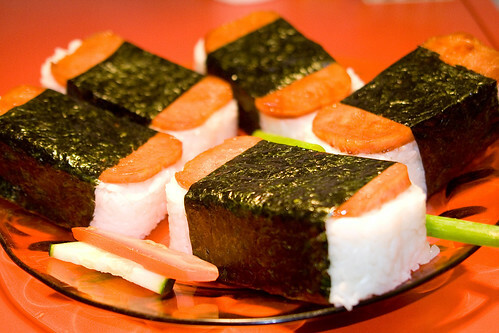 i love SPAM musubi and i love this site!!! thanks for creating it. when i lived in hawaii i would always get SPAM musubi from the 7-11 hehe…no such luck here on the east coast…=/ but when i found this site i had hope again! thanks. Never seen spam musubi at 7-11 (only at L&L’s Hawaiian BBQ), but glad I can give you hope again! Hi, regarding “treat and eggs”, I suspect what your father may have been thinking of is Treet, which is made by Armour. It’s not too similar to Spam, having a rather different flavor, but is usually quite inexpensive (a can about twice the size of the one you used for the rice molds here is 99 cents some places in NYC). I would say I prefer Spam overall, but for stocking the cabinet it’s much cheaper. Just the trick for waking up hellahungry after sleeping for 19 hours after a double shift (I like to chop it up and toss it in with a package of instant mashed potatoes (the Idahoan ones that don’t need anything but boiling water)) at which point I naturally go back to sleep =-D I’ll go back to thinking about sushi at 0653h here in Queens (have learned the rumored location of a 24hr sushi place in Koreatown in Manhattan but haven’t gotten the urge just that bad yet, a Dr Pepper and a Twix from the soda/candy machine at the station will hold me over for now). That really looks delicious. I got to try it some time. Omg i looove Sushi!! this recipe looks so good, thank you i cant wait to try it!